It’s hard to believe that 20 years have passed since two of the bleakest purveyors of doomed psychosis, namely Noothgrush and Corrupted, unleashed 35 minutes of suffering on one split LP. Perhaps thought buried by grime and rust, the much sought-after release has now been excavated in 2017 and given a fresh layer of tar via remastered audio (Brad Boatright) and new artwork (Hal Rotter). Today there’s countless bands mining every single facet of what is mostly incorrectly called Doom. 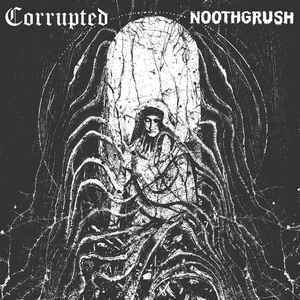 The Noothgrush / Corrupted split reminds us that ‘sludge’, doom’s most nihilistic offshoot, wasn’t about upbeat warm waves of ‘stoner’ riffs and top dollar vintage tees but about landfills of hatred, misery and self-loathing, a total negation of life and a completely uncompromising and untrendy sound. 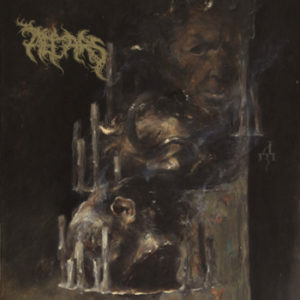 Music that wants to punish you and itself with an all consuming dread that makes even the bleakest Vitus moments sound cheerful by comparison.